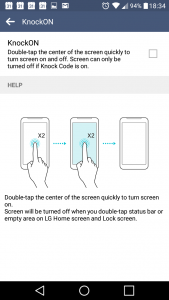 Most LG phones come with a “knock code” lock screen feature. Instead of using a pattern or PIN, you can elect to tap the screen in a certain pattern to unlock your phone. I like having options, but never actually use this myself. Consider how difficult it is if you need someone else to access your phone. Imagine driving somewhere, and you need a passenger to check your phone. If you use a PIN, you can just say “yeah, the PIN is 1234” and the passenger can quickly figure it out. 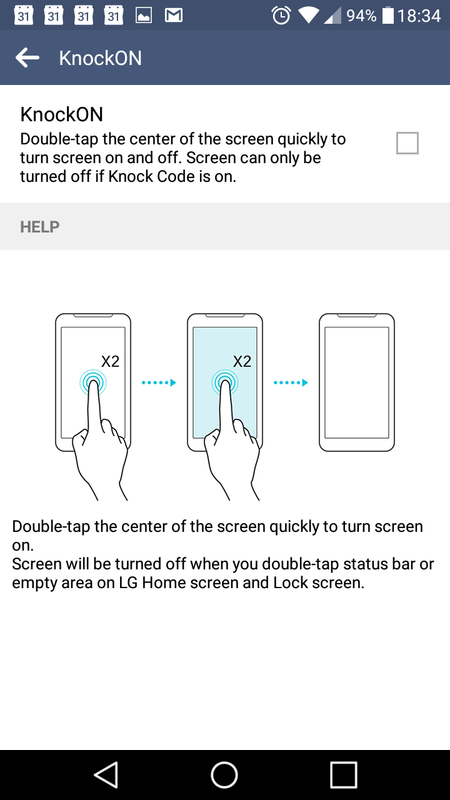 If they’re unfamiliar with knock codes, you’ll have to explain the entire concept: “OK, imagine the bottom half of the lock screen divided into four equal boxes numbered 1, 2, 3 and 4 starting at the top left. You need to tap 1, 4, 2, 2, 3, 4”. 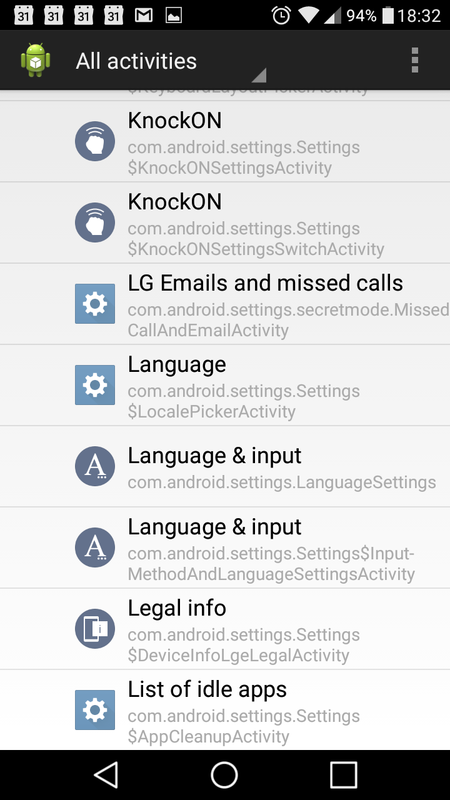 Many LG phones also come with a similar feature called KnockON. This turns the screen on (but does not unlock it) if you double-tap it. Thing is, this sometimes causes the screen to come on when you don’t want it to. If you have your phone in a bag – or, in my case, between my fingers with a handful of stuff getting out of the car – the screen can turn on by itself, wasting precious battery life. LG used to provide the option to turn this off. All one had to do was go to Settings > Lock Screen and tap the LockON option to turn it off or on. But LG has hidden this option in newer versions of Android. So how do you turn it off? Note: Please see the update at the bottom of this post! The following procedure is easy, doesn’t require root, and is easily reversible. 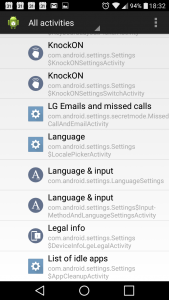 1) Open the Play Store, search for, and install, an app called Activity Launcher. 2) Once the app is installed, open it. 3) At the top of the screen, you’ll see a drop-down box allowing you to change the display from “Recent Activities” to “All Activities”. Select “All Activities”. It will likely take a minute or two to load the next screen, and you’ll see a progress bar giving you information about that. 4) Scroll down (waaaayy down) to Settings, and tap on that. If you have more than one “Settings” entry, try the first one. Contrary to what the Settings page says, after unchecking the box, you’ll be able to turn your screen off or on via the power button, like a normal person. 7) OPTIONAL: If you like, you can create a home screen shortcut to the KnockON option by long pressing the KnockON option in step 5 and choosing “Create Shortcut” instead of just tapping it. 8) OPTIONAL: If you like, uninstall the Activity Launcher app. You will, however, need to download and install it again if you want to enable\re-enable KnockON. If you’ve made a home screen shortcut (mentioned in the previous step), it will continue to work if you uninstall Activity Launcher. UPDATE (04/17/2017): An easier option is an app available on the Play Store called V10 Hidden Settings. Although it’s designed for the LG V10, many of its functions – especially the ability to turn KnockON on or off – work on my Stylo 2. Note that many features of this app will not work on a non-V10 phone: “Quick Info”, for example, gives me a “this device not supported” message when I tap on it. And “Screen Mode” (which gives you the option of choosing standard, vivid and natural color options) doesn’t give me an error message, but doesn’t appear to do anything at all on my Stylo 2. I have been searching for a solution for days and this worked perfectly with my lg k4. Thank you! Thank you! I tried other things that people suggested to no avail but this worked great on my LG Escape 2. Thank you so much, I just followed this simple process and I am very happy with the results! Thank you ! 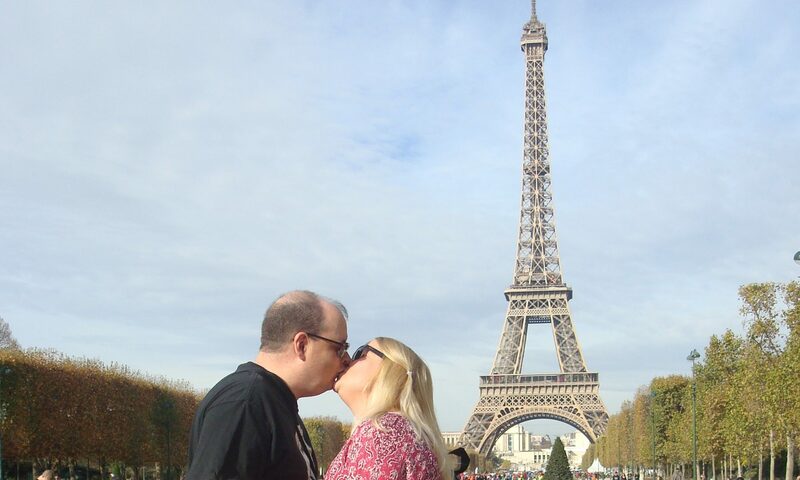 Great advice and was able to get rid of KnockON ! Wish I would have seen this before I threw my LG Rebel in the trash! it would turn on by itself.